Clerks (retronym: Clerks: The Animated Series) is an American adult animated sitcom that was first broadcast in 2000 that was based on Kevin Smith's 1994 comedy of the same name. It was developed for television by Smith, Smith's producing partner Scott Mosier and former Seinfeld writer David Mandel with character designs by Stephen Silver, known for character designs in Disney's Kim Possible and Nickelodeon's Danny Phantom. It is the first television show to be set in Smith's View Askewniverse. Title card featuring the four main characters. Top from the left: Dante Hicks, Randal Graves, bottom from the left: Jay, and Silent Bob. 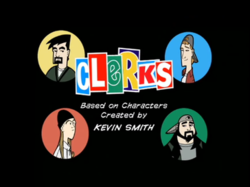 Clerks: The Animated Series was produced by Miramax and View Askew Productions in association with Touchstone Television. Produced with Touchstone Television, Clerks was Disney's second adult animated series, after The PJs, but it was also the first and, so far, only adult animated series produced with Disney Television Animation, which was uncredited. According to the commentary for the series premiere episode, Smith and Mosier first had the idea of the animated series since 1995. Into that same commentary, Mosier claims that they pitched the series to "every" network. These channels include HBO, Fox, The WB, and several others. They were given a thirteen episode order from UPN, but turn down the offer in order to be on a bigger channel like ABC and were told that UPN will be off the air within a year. On a bonus feature, Smith revealed that they initially casted Alan Rickman as the voice of Leonardo Leonardo. So they decided to design the character after Hans Gruber from Die Hard. Rickman disapproved on the design because he didn't want to play that character again. ABC eventually turned Rickman down due to cost issue and was replaced by Alec Baldwin. Only two episodes were broadcast on ABC in the year 2000 before the series was canceled. Several factors contributed to the cancellation, including low ratings, the show's not fitting in with ABC's other programming, unsuccessful test-screening to older audiences, and ABC's decision to air the shows out of order. ABC aired the fourth episode first, as opposed to the intended first episode, and then aired the second episode despite the fact that the second episode is the 'flashback' episode, and derives much of its humor from the fact that it flashes back to the first episode (as well as the beginning of that very episode) rather frequently. Additionally, the second episode aired without the scene from "Flintstone's List", the fictional RST Video rental that spoofed Schindler's List. All six episodes were released on DVD in 2001, marking one of the first occasions in which a short-lived TV series found success in this format. The DVD commentary features cast and crew who frequently cite their disagreements with the network over the show's development. The entire series was eventually aired on Comedy Central, with the unaired episodes airing for the first time on television on December 14, 2002. In 2006, digital freeview channel ITV 4 in the UK, began broadcasting episodes late on Monday nights. Starting November 14, 2008, Cartoon Network's Adult Swim aired the series on Friday nights. Several scenes filmed for, but cut from, the film Jay & Silent Bob Strike Back (but included on the film's DVD release) contain metafictional moments when Randal makes references to the animated series, as well as its cancellation. On his DVD commentary for the film, Smith said the intent was to make the quick cancellation of the series a running gag. The series was rated TV-PG during its airing on ABC, but was re-rated TV-MA when it moved to Comedy Central. Billionaire Leonardo Leonardo returns to Leonardo, New Jersey and opens the Quicker Stop right across from the Quick Stop, which takes away all of Dante and Randal's customers, and nearly puts the Quick Stop out of business. The duo set out to stop Leonardo by uncovering his plot to enslave all of humanity, but are scoffed at during an appearance at Town Hall. Jay and Silent Bob, who had been selling illegal fireworks to children, inadvertently blow up the Quicker Stop, thwarting Leonardo's plans. Dante and Randal get locked in the freezer of the Quick Stop. There, they look back on their lives, primarily in clips from the same and previous episode, including foiling Leonardo's evil plans, working at convenience stores in the United Kingdom and India, how Randal got them kicked off The Real World, and their first meeting as children. Jay and Silent Bob also manage to get themselves locked in; Silent Bob eventually uses a crowbar to get them all out, only for Dante and Randal to become locked in the video store. In a parody of Stand by Me, an elderly Jay narrates what became of his friends following the events of the episode. Quick Stop is put under government control after Leonardo is said to have been infected with a deadly virus by a monkey at the new pet store next to RST Video (at which they find Patrick Swayze working). Unfortunately, Jay and Silent Bob steal the monkey so they can teach it to smoke. The town of Leonardo is to be destroyed unless Dante and Randal manage to stop the helicopter pilot from dropping a bomb. After Randal tells the pilot that Dante is gay, Dante is forced to state that he is gay on live television to save the town. Randal is left in charge of the Quick Stop as part of a bet between him and Dante. Jay sues the Quick Stop for $10,000,000 after slipping on Randal's spilled soda. Randal is Dante's lawyer for the case, while Judge Reinhold presides, and several NBA all-stars are members of the jury. Randal ends up doing more harm than good, putting Dante at the mercy of the courtroom. Before the verdict of the case can be announced, a disclaimer informs the audience that the script for the conclusion of the episode was lost, and the remainder of the episode will be told through Korean animation. Dante and Randal attend their high school reunion, where Randal discovers he has the ability to turn women into lesbians, and Dante is accosted by his old baseball team because they don't remember him (although Dante was the coach that won them the championship game). Leonardo decides to let Dante manage his Little League team. The team is on a losing streak until the inclusion of Jay and Silent Bob (as Jay is still in the fourth grade for being held back so many times and is technically eligible to play). Meanwhile, Randal is put into slave labor after beating the high score on an old video game. Dante and the baseball team discover Randal while searching for the baseball team they have been scheduled to play (which turn out to be some of the children enslaved to work in the mines). Dante and Randal work inside the Quick Stop discussing various things after being told that they need to make the show more similar to the original Clerks. Meanwhile, outside, Dante's supposed to have a date with Caitlin Bree, Jay and Silent Bob go to a fair where havoc ensues, Walt and Steve-Dave need stuff, Leonardo Leonardo finds a soccer team on his roof, and Dante keeps getting called by a guy who wants to show him "the truth about The Matrix". Eventually, due to a phone call unknowingly made to the President, the Army surrounds the Quick Stop, the President is attacked by hookers and vampires who are enraged to find RST closed, and Dante and Randal finally go outside, where the animators put them in various awkward situations until it is revealed that Jay is the one behind it all. Randal exploits Jay by making "snoogans" a catch phrase, leading to Jay becoming a recording artist. Randal buys KITT from Knight Rider at a used car lot. The car becomes envious of Randal's relationship with Dante and attempts to kill Dante and impersonate him at the store (a reference to Single White Female). He manages to trick everyone except Dante (and likely Silent Bob) with his thin disguise. Jay joins a boy band. Silent Bob is sad that Jay is gone, so Randal and Dante bring Bob in to work at the Quick Stop. He turns the store around and it becomes a great success. Silent Bob is given a piece of gum and says, "Mmm, Juicy Fruit," which shocks Dante and Randal asking him, "You can talk!?" (a reference to the Chief in One Flew Over the Cuckoo's Nest). Allegedly in the 7th or 8th episode, Dante and Randal would have added to their cast of friends a boy ward, named Robin, in a direct reference/parody of Batman's own "boy wonder", though like Lando, would probably not have been featured prominently. This plot element was most likely not intended to actually be part of series as it was described by Kevin Smith after mentioning that Paul Dini, best known for his work on Batman: The Animated Series, had also worked on Clerks: The Animated Series. The DVD commentary briefly mentioned an episode idea where Ben Affleck would play the King of Canada. The episode premise was also described as "the Aladdin parody." There was also going to be a Saturday Morning spin-off called Li'l Clerks, which would feature child versions of the characters. Another spin-off, titled Old Jay, would feature Jay as a grandfather. This evolved from the last segment of Episode 2, which was a parody of Stand By Me. For several years following the series' cancellation, Smith announced plans to make an animated film. He revealed in a commentary on Episode 6 that it would go theatrical (with the hopes to win an Academy Award for Best Animated Feature), but later made plans to go direct-to-video. The basic plot involved Dante and Randal making a movie about their lives at the Quick Stop, a reference to the production of the original film. In an interview, Smith expanded on the delays surrounding the film. Apparently, when the Weinsteins left Miramax, owned at the time by Disney, the split was not completely amicable. The rights to the Clerks television show were still owned by the Disney Corporation, who as a result were reluctant to work with The Weinstein Company, throwing the future of Clerks: Sell Out into question. At the 2007 Cornell Q&A, Smith said due to the Miramax/Weinstein argument "you will see a Jay and Silent Bob cartoon before Clerks: Sell Out." However, when Miramax was purchased by Filmyard Holdings in 2011, Smith revealed on Twitter that Miramax had contacted him for new projects, and the possibility of reviving the series came up. Clerks: The Animated Series was named the 98th best animated series by IGN, comparing it to Firefly due to its partial, out of sequence airing. They specifically praised the second episode for its parody of the old television staple of clip shows, by showing clips of the previous episode as well as clips from the episode itself. The show was released on DVD in a two-disc collector's edition set called "Clerks Uncensored." The "Uncensored" of the title refers to the restoration of a segment that was cut from the ABC broadcast of the second episode, as well as an uncensored episode introduced by Jason Mewes and Kevin Smith, portraying their Jay and Silent Bob characters. The DVD was also given an R-rating by the Motion Picture Association of America for some sexual humor. ^ "The View Askewniverse - News - Clerks - Canceled". viewaskew.com. Retrieved 21 February 2015. ^ Clerks: The Animated Series: Episode 6: The Last Episode Ever commentary. Buena Vista Home Entertainment. ^ "'Clerks: The Animated Series' Might Return in 2013 - /Film". Slashfilm. Retrieved 21 February 2015. ^ "98, Clerks: The Animated Series". IGN. 2009-01-23. Archived from the original on 2009-01-19. Retrieved 2009-01-23. ^ "Clerks: The Animated Series". IGN. Retrieved 2012-03-26.